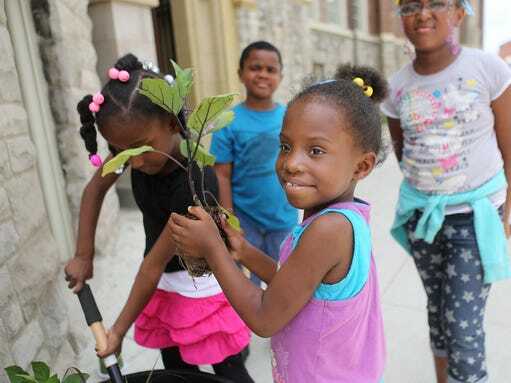 On Friday, Over-the-Rhine will celebrate progress on a project more than six years in the making – a garden at the Rothenberg Preparatory Academy. But it isn’t just any garden. The 8,500-square-foot roof and the raised beds constructed there represent a mammoth effort by the community – powerful persistence, neighborhood pride and good fundraising. But at the core is education. The project began in 2008 when the Cincinnati school district was in the midst of its districtwide construction plan to replace or renovate all of its schools. The district initially planned to raze and rebuild the Rothenberg school. But the community rallied to save the beloved 100-year-old building. Residents persuaded the district to renovate rather than tear down. It was a big victory for the community in this historic but often troubled neighborhood. It was also the start of a partnership that would guide the project, including the part of the building that is often overlooked: the roof. Coleman, a board member of the Over-the-Rhine Foundation, came up with the idea. Coleman, an urban activist who had played a big role in the push to save the school from the wrecking ball, helped create the partnerships to make the project work. He’d discovered the original school had its playground on the roof because the neighborhood was so congested there wasn’t a good spot on the ground. Around the same time, Coleman met the owner of the popular Granny’s Garden and became enamored with the idea of outdoor classrooms. So he pursued a plan to repurpose the school’s roof into an educational rooftop garden. The project got buy-in from the community and the school district. But it would cost money. Installing a rooftop garden isn’t cheap. So the Rothenberg Rooftop Garden became a project of the Over-the-Rhine Foundation. And donations started coming in. The first $30,000 paid for an elevator to take students and staff all the way to the roof. Six years and $300,000 later, the project is ready to be completed. Organizers say it’s a testament to the community, which has always fought hard for this school and the neighborhood.